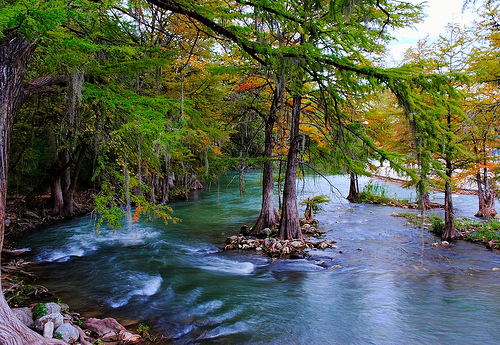 The Guadalupe River in Texas is located close to the historic town of Gruene. The town’s history can be traced back to 1872. However, it was a virtual ghost town by 1950, but now it’s as popular as ever because of its proximity to the river. The river is popular with campers, hikers, and canoeists as it’s an ideal place to relax as well as have some fun. The most visited section of the Guadalupe River is between New Braunfels and Canyon Dam. This is where adventurists love to go river tubing, canoeing, rafting, and kayaking. The flow of the river fluctuates often. However, the normal flow is typically between 100 and 300 cubic feet each second, which is ideal for floating. The river offers some excellent scenery including the limestone banks of the river which sits underneath pecan and cypress trees. There are numerous cabins and lodges to rent along the river which offer a peaceful and serene setting. There are also several campgrounds available along the route where you can pitch a tent and enjoy a night time fire as well as Mother Nature. There are plenty of restaurants and places to buy supplies for your camping trip. This area of the Guadalupe River isn’t as well known as some of the nearby state parks, but it’s just as much fun and has plenty to offer campers and nature lovers.